Those of you who have been waiting to pre-order the BlackBerry Priv, perhaps you should be getting your money ready. Ads that have been seen on various websites state that pre-orders for the Android powered slider will begin on Friday, from BlackBerry's own website. So far, we have seen the U.K.'s Carphone Warehouse, and Canadian carrier Rogers accept pre-orders for the phone. For the last few weeks, it has been rumored that the Android-flavored slider would be released in November. A pre-order period that begins on Friday would certainly dovetail with a November release of the phone. While there has been no official price released, Carphone Warehouse is asking nearly $900 for the Priv SIM free, and Rogers will sell the unit for $399.99 with a two-year contract, and $799.99 off-contract. BlackBerry CEO John Chen has talked about selling the phone with an installment plan. There is a lot riding on the shoulders of the BlackBerry Priv. A success could keep BlackBerry churning out more handsets, while a failure could mean the end of BlackBerry as a smartphone manufacturing company. Ironically, there are many who see the Priv as a device for the enterprise because of the security features that BlackBerry baked into Android. On the other hand, there are many consumers who see the Priv as a attractive Android device featuring a sharp QHD screen, with a high pixel density for viewing videos and playing games. And the physical QWERTY makes messaging a lot smoother. 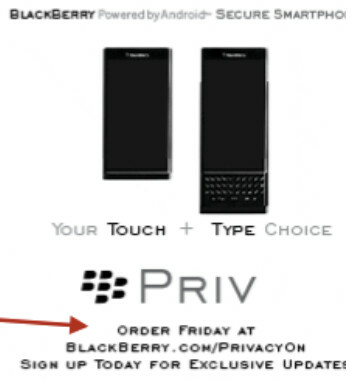 Many of you have been waiting a long time for the Priv, and if the ads we've seen are right, you only have to wait two more days to reserve your phone from BlackBerry. Passports launch price was $699 in the US. There was a special promo price of $599 online at BlackBerry's website soon after. "There are only two kinds of Droids: cheap crap and overpriced junk" - Bobby Buster This one certainly belongs to the latter category. Those prices are far above what they were quoting a couple weeks back, I hope that they're wrong for BlackBerry's sake. Hopefully, BlackBerry will release official pricing that will be easier on the pockets. If they want to survive, they would. They will not be able to compete with Samsung and Apple in the higher priced category and with the affordable Nexus, minus the overpriced brick from last year, they don't really stand a chance. They should have started out in the midrange price mark first to establish themselves. Not exactly. The dunce I was making fun of wasn't worth keeping an avatar for. By the way be careful, there's someone else who is impersonating you, I was only able to tell because of the number of posts and member since date, be careful, I'd report them or something because they are making you look like a retard. I haven't seen it. Did they comment here in this article? No, he commented on the angry birds one, look for my username, I commented to his comment. Bad grammar but in any case you're getting a bad reputation. If they started out at the midrange price mark, they would most probably be selling handsets at a loss. That wouldn't help them, either. They don't need to compete with Samsung or Apple, they just need to bring something different to the table, which they do. Carriers will most likely have deals and subsidized pricing for the Priv. They don't need to yet they're charging a pretty high price for it. That just doesn't really seem logical especially since carriers are trying to move away from subsidized phones. They have already lost before they even started the race. Carriers offer other deals on handsets, like leasing, zero down, etc. BlackBerry is now in a position to take advantage of this with so many carriers now willing to carry a BlackBerry handset (Priv) when they haven't been able to do so in years prior. Yes, the Priv is a premium handset and is worthy of the pricing, it's just that considering BlackBerry's current position in the consumer market, the price just isn't right at this juncture. And the one thing that you and many others just don't seem to understand is that BlackBerry doesn't need to outsell Samsung and Apple. They just need to hit that 5 million-handsets-sold-a-year-mark. Yeah except those aren't subsidized programs. You just showed some disagreement with the pricing and now you're retracting and saying the pricing is deserving. Lol are you crazy? What makes you think the Priv is worth it at that price when you have the Nexus 6P that offers premium design and specs at such an affordable price? Then there's the MXPE which is finally a Moto X worth getting at an affordable price. Then of course there's the Galaxy lineup of phones. They are going to go out belly up. Just look at HTC. I already mentioned that they are not subsidized programs. They are programs offered by all four major carriers in the US. I'm not retracting anything. I stand by what I said. READ and COMPREHEND what I typed again. I said FOR ME, the price is fine as I believe that the Priv brings something unique enough to the table. I'm referring to the total package. But for what BlackBerry is trying to do, which is make a hard push into the consumer market, the price isn't good for the average consumer. They can't expect to sell a great deal of Privs to consumers that already have a negative image about BlackBerry in their heads. People like you. The Moto line of devices have always taken the "affordable Android" route. BlackBerry devices have always been priced at a premium, for the most part. I won't even spend too much time responding to your last sentence, as you know full well that if BlackBerry's hardware division folds, they will still be in business due to their software, QNX, BES, and the IoT. You just said carrier subsidies before I corrected you. You're just backtracking again. For you that's fine if you agree about the pricing. What you fail to realize is that YOU ARE NOT THE ONLY ONE AROUND. Stop trying to act like you're the default, the one who sets the standard for BlackBerry opinions. HTC have always offered their devices at a premium and look where they are at now. I'm not backtracking. Carriers in the UK offer subsidized pricing, if I'm not mistaken. Keep up with me. I ALSO MENTIONED THAT IT'S JUST FINE FOR ME AND NOT FINE FOR OTHER CONSUMERS. Stop trying to make it seem like I said anything other than WHAT I SAID. If you have problems with your READING COMPREHENSION, that's a problem you should get fixed, ASAP. Either that, or you're just FLAT OUT LYING TO MAKE IT LOOK LIKE YOU HAVE A VALID POINT, which you don't. HTC has their own set of problems which have nothing to do with BlackBerry. BlackBerry will be around long after HTC is gone, due to their not putting all of their eggs in one basket. We're talking about the US. You keep up. Lol apparently what I said must have affected you because A. you're getting butthurt and being so defensive and B. you're talking in caps. Talking in caps DOESN'T MAKE YOU SOUND INTELLIGENT. While that's true, the market is highly volatile. Anything can happen, you just don't want to see the cold hearted truth. YOU'RE talking about the US. I'M talking about everywhere the Priv is sold. Stop thinking the convo only revolves around what you want. Apparently, you got butthurt first, since YOU started with in caps. GUESS YOU DON'T SOUND INTELLIGENT, EITHER. And pointing out you're poor reading comprehension isn't me getting "defensive", it's me pointing out a fact. The "truth" is, we don't know what will happen. It's all just speculation at this point. I'd rather give it a few quarters and then make an opinion based on the sales information. In other words, a logical one, not one based on assumption. Damn. 800 Canadian... If it were to be 700, even 750, the bar would have been set perfectly. It's cause the Dollar is so low. It'll be priced 599.99 in the US. Conversion puts $800CAD at $610USD. 800$ really? Im not even considering this. Not in USA, Canadian dollars are worth less, plus we enjoy of cheaper offerings than other countries for some reason even though we don't need them.